The miniature Dendrobium, one of over 1,200 species of orchid in the Dendrobium strain, grows to be no more than 8 inches tall, unlike the standard version, which can reach up to 3 feet in height. The flower is Indigenous to the Far East and parts of Australia, New Zealand and New Guinea. Its beautiful flowers make striking houseplants, and are often used to accent wedding bouquets. Proper care and attention to your dendrobium ensures that it will add beauty to your home throughout its life. Provide the proper potting medium. As an epiphyte, it grows naturally high in tree tops or on rock faces and likes a porous medium that drains freely. It should usually be re-potted every two years or so to allow for growing and expanding roots. 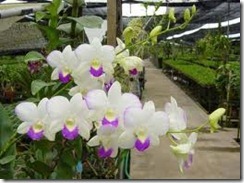 Keep the humidity in the orchid’s growing area between 50 and 60 percent. Since this is higher than what is tolerated in most homes, set your orchid’s pot on a bed of moistened pebbles; as the moisture evaporates off the stones, it will raise the humidity immediately around the plant. Keep your orchid watered and fed. For fully grown Dendrobiums, allow the soil to dry completely between waterings, but do not let it stay dry. Fertilize once a week with an orchid-friendly fertilizer diluted to an eighth to a quarter strength. Provide sufficient light for the orchid. Blooming depends on daylight hours. Place your orchid in a sunny window, but protect it from scalding direct rays. You may also use grow lights to provide extra light in the winter. Allow a 20-degree difference in ambient temperature between day and night. A home that is 72 degrees Fahrenheit during the day needs to drop to 52 degrees at night for this orchid to thrive.